Simcom has always been a 32bit only plugin. You'll either need to use the 32bit Teamspeak client or use one of the other plugins that support 64bit. Do you mean you could use voice in an earlier version of JoinFS? It's never been supported within the app. It was when I first discovered your fantastic software. I believe it was around version 1.1.4 but not certain. 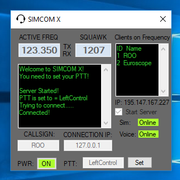 For those looking for a 64 bit TS comms program I suggest BFSGSimCom64. I tried today in 64 bit Win 10 and the newest TS and it worked well. My I ask if this plugin works similar to this. Once you switch frequencies on you active radio channel it creates a channel based on that frequency. Correct? So therefore once you select another frequency it closes the prior Chanel and it creates another channel for the new frequency. Correct? Also if you are using com 1 within the sim there is no way to hear communications on com 2. Is this a correct statement. Once setup when someone joined the server and tuned their radio to one of these frequencies the comms program would place them in the channel associated with the frequency. This assume the person joining the server was running the comms program. The comms program doesn't not provide the capability to monitor/hear two channels/frequencies at the same time. Well I've created the first version of a voice app. Let me know if it could be of use? Downloaded, and will check it out. I think this is what i was looking for when I originally started this post. Let me know if you think it could be of use. Else I'll pop it in a dusty folder, out of the way, only to be worked on when I've finished with other projects.